Creating a wallpaper website need a lots of money for Wallpaper Script , Hosting space for script ,Bandwidth , Domain name etc which overall cost around 50$ wallpaper script, 12 $/year domain name registration charge along with Minimum 4$ per month on hosting plans etc what if you don't have invest Cent from your pocket instead of you may earn money with your wallpaper website . Yes you may do so by creating a wallpaper blog instead of wallpaper website since creating wallpaper website (Known as Wallpaper blog ) is easy with blogger blog , It does not require special knowledge about Web hosting , Hosting ,designing etc and you don't need to worry about bandwidth and monthy /yearlly hosting renewal charges .The most important thing in creating wallpaper website with blogger is that you don't need to invest money for buying Bandwidth , as blogger.com is free blogging platform which allow unlimited bandwidth for free along with the option to earn money by monetizing your blog content .Another Important thing with blogger blog is that you can directly embed wallpaper , photos , image by using upload with image URl feature however you can't upload wallpaper directly to your blog instead you need to authorize /signup ( via your Google accoun ) to Picassa to upload your wallpaper Indirectly to your blogger blog with Image embedding code which may be accessed by your visitor using your blog only . To create your blogger account you need a Google account , Go to Google.com and signup your Google account for free , Once your Google account would be created then Sign-in to your Google account with your Google Email id and Password ( Tips to make strong password ) and then Go to Blogger.com and Fill out your name , username and other details and Authorize your email id by accepting terms and service , hence your blogger account has been created now you may access your Blogger Dashboard by visiting blogger.com and sign-in using your Google (Gamil ) id and password . Next thing in developing your own wallpaper blog / Photography blog in blogger.com is to register your blog Sub-domain name , Once you log-in to blogger dashboard , Click on New blog ( At mid top right side of blogger dashboard ) . First Enter unique address ( Relevant Domain name/Sub-domain name is considered Seo Friendly ) of your blog and then Enter Title of your blog , Choose template and click on Create blog ( At bottom right ) . Now your blog has been created and your blog start looking like a blog but without content . Actually , we wan't to create a wallpaper /photography blog therefore we need a gallery template to give Blog a Wallpaper blog / Photography blog look .So search for the Blogger Gallery template and download one for your blog , it may be available for free or you need to buy it . Once you downloaded your Gallery template for blogger , extract your template Rar archive if Winrar , choose .xml extension file and upload your Downloaded template in blogger . Cool you have created wallpaper /photography blog . Adding wallpaper/Photograph to you blog . Although you have created your wallpaper /photography blog but it may not be look like wallpaper blog without any Content containing wallpaper / images , So click on Create new post or New post form blogger dashboard and upload some images/wallpapers/photos to your blogger blog Publish your Post once you finished with uploading wallpaper /images/ photos and then click on publish but make sure to add one images/wallpapers/photos per post . Now do same for uploading other wallpapers . Congrats your wallpaper/photography blog has been created and look like wallpaper website now you can preview your blog and can customize your blog vis blogger layout ,Template designer dashboard etc. Do not upload wallpaper/image/photos which infringe copyright of some one's works . Avoid too much of image embedding from other blog or website , may lead your blog marked as Spam blog . Give proper credit for the linked /embedded wallpaper . 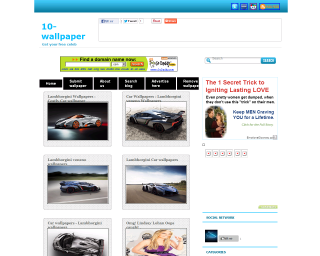 Your blog must have Contact us form for your wallpaper blogger blog so that your visitor may contact you . Your blog must have Related post widget , this will help your blog Seo as well as it will give professional look to your wallpaper /photography blog . Your blog must have social Sharing button , It helps in improving traffic and your work popularity .